for Pre-Order from Amazon at 22% off. The album features music from such artists as Ben Harper, Gomez, Lucinda Williams and Joe Cocker, as well as previously unreleased tracks from Sarah McLachlan and Elvis Costello. 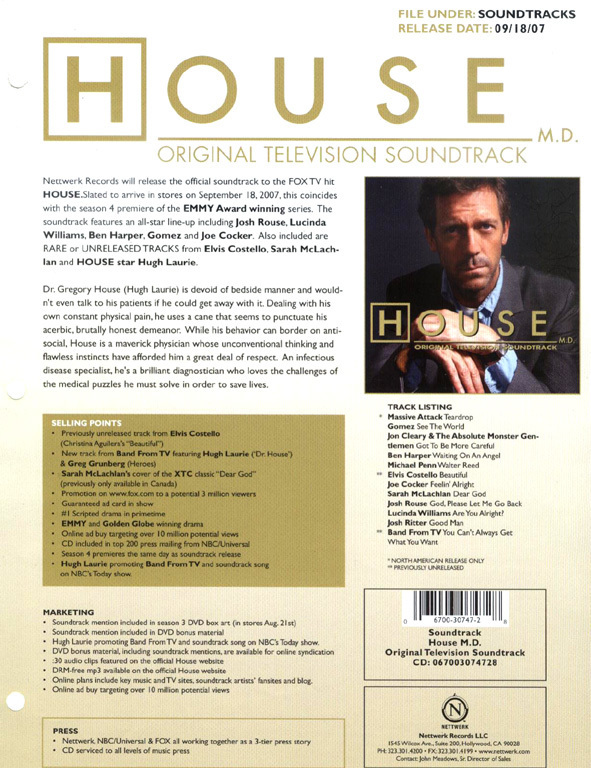 In addition, the soundtrack includes HOUSE star Hugh Laurie covering the Rolling Stones classic "You Can't Always Get What You Want" with Band From TV, including Greg Grunberg ("Heroes"), James Denton ("Desperate Housewives"), Bonnie Somerville ("Cashmere Mafia"), Bob Guiney ("The Bachelor"), to benefit Laurie's charity Save The Children and other non-profit organizations. 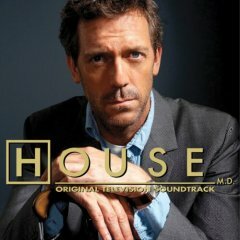 The 12-track compilation echoes the alluring and sometimes dark feel of the emotionally charged series, with Massive Attack's "Teardrop" (the theme song of the series) opening the collection that also includes Ben Harper's "Waiting On An Angel," Lucinda William's "Are You Alright?" and Josh Rouse's "God, Please Let Me Go Back." Fans also get a bonus with never-before released tracks including Elvis Costello's fresh spin on Christina Aguilera's #1 hit single "Beautiful" and Sarah McLachlan's cover of the XTC classic "Dear God" (previously only available in Canada). Lucinda Williams Are You Alright? More Details available from the Fox site including some clips to listen to.